After thinking of getting a new phone other than the new overpriced iPhone X, I started looking into fitness trackers that I could use with a different operating software. Here’s my review of the Fitbit Alta HR after trying it for a week. Honestly, if I had any other phone it would be my go to fitness tracking wearable. However, as an iPhone user Apple knows their market and how to keep their customers happy in their eco system. All of their products works in perfect sync and harmonies together when you own more than one of their devices. For example, I can use enabled fitness apps on my series 1 iWatch such as the AutoSleep App that syncs with the app on my phone to see all of the details that my watch has tracked. This is typical of most fitness trackers, but the information available on the watch is more detailed than the limited 8-bit like Fitbit screen. I love the personalisation available for the Fitbit, the Tom Ford accessories collection calls my name! The prices of them are similar to the lower budget iWatches, but I would be more inclined to spend the money on gold Fitbit hardware than a different colored strap. Ultimately, being the tech giant that Apple is, there is always an app for everything. Although it wont be all in one place, they all work with each other and I can connect them all up. So I will stick with my iWatch for now whilst I still have my iPhone and maybe I will end up unwilling shelling out the extra dosh for an upgrade, so all of my devices are more personalised. Do you have a fitness tracker? Let me know all of your favourite ones in the comments! Check out my review of the Apple Watch 1st Series here and see all my wearable tech posts here. I’ve been a busy wearable tech assistant at work with MadeWithGlove and WoW UK Women of wearables! Check out what we’ve been up to. 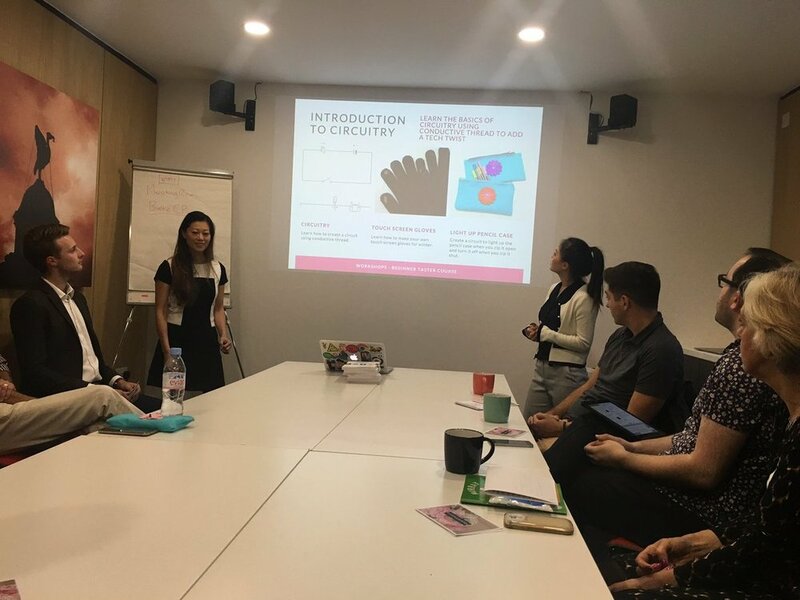 WoW UK co-founder Marija Butkovic and Wearable Tech assistant Rachael Yeung exhibited at the WOW Talks TV’s first women in tech event on 20th September 2016 in London. Here is Rachael’s account of it all. All of the school pupils were so intrigued! I have been busy yet again creating more wearable tech! This time it is a UV sensor hat that reminds you to reapply your sunscreen. With summer being quite hot this year, we definitely need to ensure we are sun safe! I have been a busy bee working on an exciting climate change project with Invisible Dust called the Human Sensor. The Human Sensor was designed by London artist Kasia Molga who brought to her project up North to Manchester as part of the European City of Science Festival. The Human Sensor live performance costumes are wearable capes which consists of a mask and sensors to dis play the air pollution that the wearer breathes in. The concept of the project is to make the invisible harmful particulates in the air visible, raising awareness of the recent findings by leading London scientists. Check out what happened on this exciting week in Manchester here. VLOG: A Hermes Birkin for £30?! Another Vlog! A Hermes Bag??! A little late due to technical mishaps, and some downright laziness due to hot weather. This weekends vlog I show you the ‘Birkin’ Hermit* bag I found online for £30! I’ll take you with me to making my must have spring/summer skirt, lots of eating with the family, and as always a cameo of my cat Misty The Moggie looking damn cute. Don’t forget to like and subscribe! *Don’t forget to check out the new donned luxury fashion names list here for a giggle!